According to a hypothesis, the name points to the origin Assyria (counted in ancient times Mesopotamia ), from where they over Spain should have come to Greece. However, according to analyzes there are no genetic links with varieties from Spain or the Middle East. The late-ripening, high-yielding vine is resilient to both mildews and drought, It produces pale yellow, full of character white with high Acid- and alcohol content, as well as storage potential, to the oxidation tend. 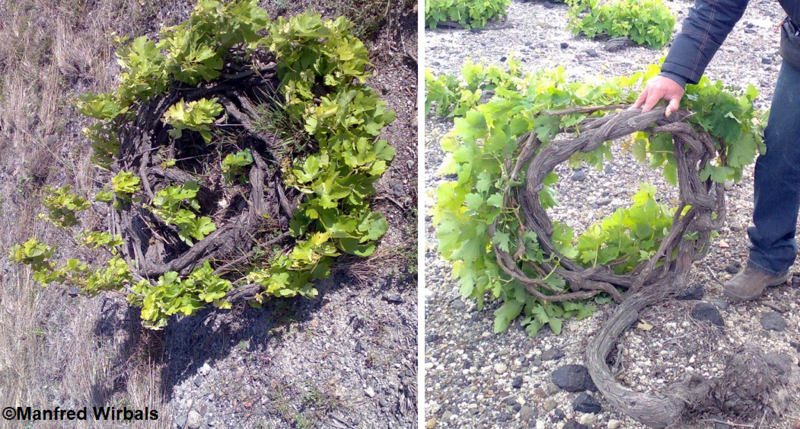 The variety is mainly on Santorini grown, where it accounts for 70% of the stock. The vines are ungrafted planted and are in the traditional form of education Kouloura behaved. The shoots are circularly woven around the grapes in the form of a nest to protect the fruit from the wind. Here it is the main variety for the OPAP white wines, which are dry and made from sun-dried grapes Vinsanto be developed sweet. In the region Attica Due to its acidity, it is used as a blend of low-acid varieties Roditis and Savatiano used, but also developed independently. Furthermore, she is on Chalkidiki in the appellation Côtes de Meliton and up Peloponnese represented. In 2010, 902 hectares were recorded. This page was last modified at 19 April 2019 at 12:27.